Pimpa is a white female dog with red-dots whose tongue is usually dangling out. Like all children, Pimpa is curious and observes the world around her, a world in which the objects are living and speak to each other. She represents children’s wishes of freedom, invention, imagination, empathy. Pimpa is optimistic and genuine, always smiling. In her world everything seems to be possible. 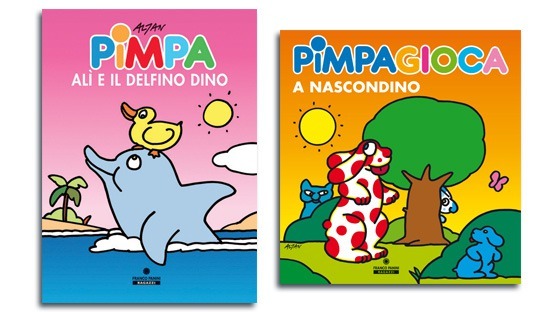 Pimpa lives in a house in the country with Armando, a kind man who is her master, her friend, and in a certain way, even her father, all in one. Armando is a positive character: good and helpful. She always goes on fantastic adventures, from Africa to the North Pole, sometimes diving deep into the sea or fl ying up into the clouds, but at night she always comes back home to the peaceful house to tell Armando about her adventures. She loves him very much but when he makes his serious speeches and gives his educational advice she mischievously makes fun of him.